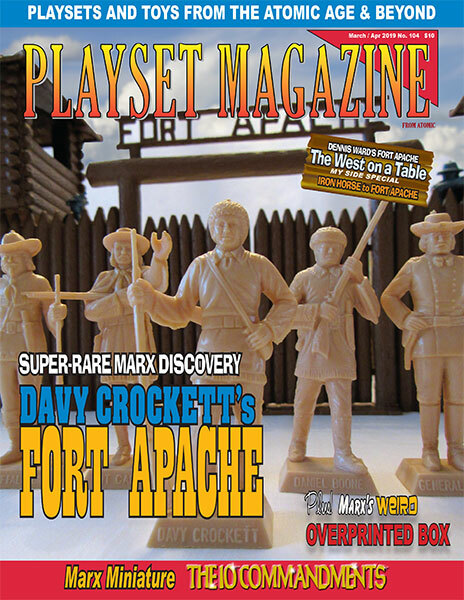 ISSUE 104: THE LOST SET DAVY CROCKETT AT FORT APACHE! The editorial this issue concentrates on a nice examination of a box which Marx apparently reused! It is painted over a lighted Gas Station carton, in a weird twist resulting in the Marx Western Ranch. It has been PJ Schafer’s passion to track this thing down and he has now found two, plus one sent in by reader Jim Grimes. It’ll all make sense when you’ve seen the photos and read what others have to say. There’s a fantastic selection of forts this issue: a homemade Fort Zinderneuf starts us off, and a truly different “My Side” by Kathy so special it’s “up front” – this is an incredible (I don’t think you’ll quibble with that description once you’ve seen it) Fort Apache display made to enhance the décor of Dennis Ward’s office / den. Next, thrill to the adventures of a Marx engine as it struggles to resupply the US Cavalry (by Marx, of course!) in “Iron Horse comes to Fort Apache”. The real reason for our existence is the rare, unique and uniquely delightful and we think the revelation of the reality of the existence of a rare playset is just so timely! Presenting for your amazement is “Davy Crockett’s Fort Apache” and yes, it is a Marx set, although a rare and obscure one. We have a complete report on it from its discovery in a Chicago parking lot to the collection of George Kroll and right onto our pages. We are indebted to George for shooting (and reshooting and shooting again) the cover this issue featuring at long last, the American Frontier Heroes figures of Kit Carson, Davy Crockett, General Custer, Daniel Boone and Buffalo Bill, all of whom star prominently in our feature story. My goodness, the great men and women who assembled this issue get a big star this time, with extended thanks to Eric Beheim, David Hennen, George Kroll, Bruce & Patty Palmer, Pat Schafer, Jim Grimes, Rick Eber, Ed Bodwell, John Titone & Sons, Dennis Ward, Mike Tiemann and I am sure I’m leaving someone out. In fact I am. There’s a delightful short piece – because it’s Easter – on Marx’ Ten Commandments playset. While this is a very short article, the photos reveal a complete playset with all its parts for the first time on these pages. However, the kind gentleman or woman who sent the photos remains a mystery for now, since the pictures were electronic and we lost track of the sender. Please, if you know who sent these great shots, let us know so that we can give you credit. You’ll see your name listed as “unknown” there in the staff masthead.